Numbers 44, 62, and 82! Oh my goodness, my readers have such good taste. Can I go fabric shopping with each of you? A devoted follower and my selection would most definetly be Good Fortune by Kate Spain. Gorgeous photos of your quilt in the magazine. It looks lovely. Fabric? Love to have some Terrain! I’d like Sophie by Chez Moi for Moda! Thanks so much for the giveaway! Please send me your snail mail addresses and I’ll have QN send a copy of Quilter’s Newsletter Special Interest Publication on Fat Quarter Quilts your way! Tomorrow I’ll be back with Bejeweled – I promise yo-yo craziness. Previous post: Another Quilters Newsletter Fat Quarter Issue Giveaway! Join my Free-Motion Quilting Idea Facebook Group! 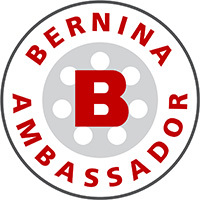 Proud to be a BERNINA Spokesperson! 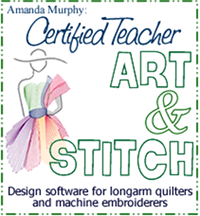 I’m a certified Art and Stitch Instructor! Proud to be an Aurifilosopher! Learn how to quilt a feather! Download “Pumpkin Row”, featuring Thankful! Download “Star Jubilee”, featuring Jubilee! Download my “Flicker” pattern, featuring Free-Motion Fantasy. Download my “Figure Skater Pillow” pattern! Download my “Skating Rink” pattern, featuring my Winter Games collection! Download my Meadow Paths pattern, featuring Meadow Dance! Download my “Folklore” pattern, featuring Folk Art Fantasy! Download my “Candy Dish” pattern, featuring Nordic Holiday! Download my alternate finishing instructions for the Sewing Room Sampler! Download my Sewing Room “Zigzag Stitches” pattern! Download my Feathers & Flourishes Evolutions pattern! Download my Sparkle Sampler pattern! Download my Sparkle Runner Pattern! Download my Sparkle Embroidered Gift Bag pattern! I work really hard to create quality content for this blog. Please respect my copyright and do not take images without permission. My name is Amanda Murphy. I'm a BERNINA Quilting and Longarm Spokesperson and I'm so glad you are here! I love meeting other quilters and seeing what they are up to! Sign up here to get updates and tutorials.